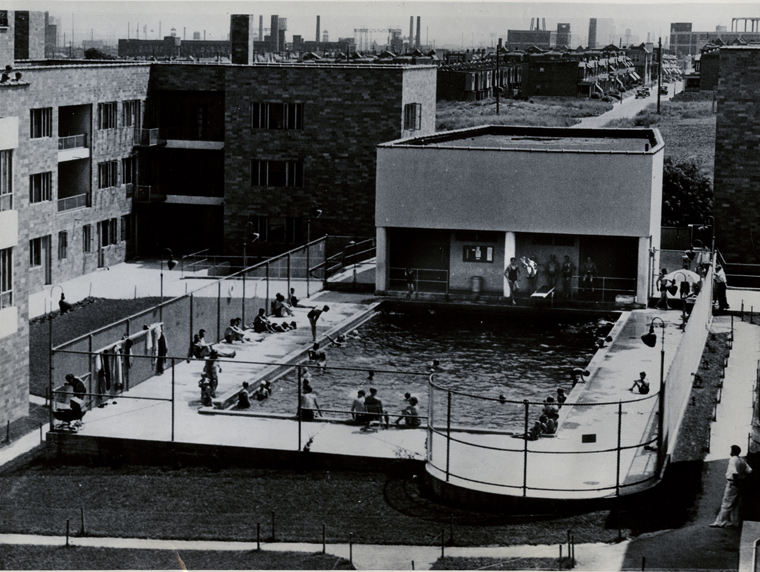 View of the pool and community hall at the Carl Mackley Houses, a 1930s housing project that (though constructed prior to its founding) best reflects the ideas of the Labor Housing Conference. Named for a worker killed during a 1930 strike, built by the American Federation of Hosiery Workers, and financed by a loan from the Public Works Administration, the project is located in Philadelphia's former textile factory district. Courtesy of Philadelphia Record Photograph Morgue Collection, Historical Society of Pennsylvania. In both public debate and architectural discourse, architectural modernism is often (irrespective of the particular critiques) addressed as primarily characterized by its form and aesthetics—an interpretation that falls far short of grasping the complexity of the modern movement. Looking at the Labor Housing Conference—an association of union members and housing reformers in the 1930s United States—the proposed research project explores the aims and conditions of an era of socially engaged US modernism, where radical forms were inextricably tied to progressive politics. Lobbying for a nationwide program of worker-initiated housing developments, the Labor Housing Conference put a fusion of social, economic, and aesthetic ambitions on the architectural and political agenda that, even eighty years later, has lost none of its relevance. Sabine Horlitz is an architect and urban researcher based in Berlin. Her PhD, carried out at the Center for Metropolitan Studies in Berlin, investigates the case of the St. Louis Pruitt-Igoe public housing project and the instrumentalization of its demolition within the 1970s urban crisis. Since 2002, she has been cofounder and coeditor of the architectural journal An Architektur, which focuses on the political dimension of architectural, urban, and spatial issues. Within this context, she initiated the Camp for Oppositional Architecture, a series of international open conferences to discuss alternative approaches within spatial practices, alongside participating in numerous international conferences, research projects, and exhibitions. Drawing on architecture, geography, and critical urban theory, her research and writing focus on the intersection of architecture, planning, and politics, concentrating more specifically on the political economy of the city, housing issues, and exploring alternatives.